This one isn’t baked as long as some of my earlier attempts, but it has a great, crunchy crust and a silky custardy interior. The caramelized flavor of the crust is just right. This little guy, along with his two buddies, was the result of my third attempt with the new molds. For my first try, I messed with batter recipe by adding more flour to offset the extra liquid from the duck egg yolks I used. Don’t ask me why I thought it made sense to change both the batter and the molds at the same time; I don’t have an adequate answer. It was obvious during the baking that the new molds made a difference, but the results were wrong wrong wrong. 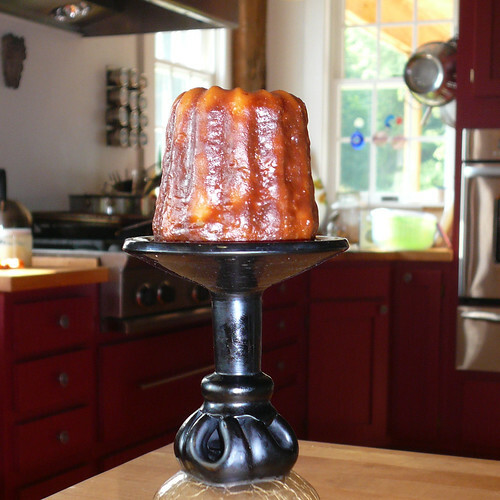 The batter rose up high and beautiful in the oven, but the resulting Canelés were uniformly matte brown (vs. glossy golden or dark brown) and very cakey. The flavor wasn’t bad, but all the specialness of Canelés was absent. The squirrels and birds in our yard made a feast of those. Ok. So for the next try I knew I had to use the standard recipe with no fooling around. I even bought the specified extra large eggs (and, you know, those extra large chicken egg yolks are still a lot smaller than your average duck egg yolk!). That batter went into the fridge to chill for 24 hours. The next evening, we baked a batch. Unfortunately, I didn’t realize I had set the oven on “Aero Pastry” – a mode our oven has that I don’t even know what you use for, except I don’t think it’s for Canelés because they were cooking very slowly. Evenly and nicely, but slowly. About 2/3 of the way through the baking, I caught the error and changed the mode to the one I usually use, “Aero Bake”. As I skimmed the oven documentation, I realized I should probably be using the “True Aero” mode to get the best results. All three of these modes are variations on convection modes. Don’t ask me what the differences are, though. I’d have to read the manual. Anyway…. it took a little longer than normal, but the Canelés darkened nicely and I unmolded them, waited about 20 minutes and tried one. BINGO! They had the right crunch, color, flavor. I had enough batter left for about 3 more, so I tried again last night, this time with the oven set correctly, and again the results were grand, though I admit I was too sleepy by the time they were done to enjoy them properly. Tonight, I’ll attempt to warm them and eat them – they don’t warm very well, but it’s worth a try.